A jam nut is used on top of any primary fastening nut to provide extra safety and security when fastening materials that are exposed to vibration, temperature fluctuations and other conditions that would cause a nut to loosen up from its bolt. Nylock washers are designed with a nylon insert within the threaded area of the nut. 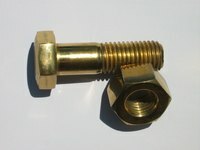 The nylon insert grabs onto the bolt threads, preventing the jam nut and the primary fastening nut from working loose. Different, customizable Nylock jam nut sizes, including varieties in thickness and inside and outside diameter, are available. Pass a hex head or a carriage bolt through the material to be fastened together. It is a good practice to use a washer below the head of a hex head bolt. Carriage bolt heads generally do not need washers. A hammer will help coax stubborn bolts through their pre-drilled holes. Brush sawdust or metal shavings off of the exposed threads with a small hand broom and place a washer over the threaded end of the bolt. Thread the first nut onto the end of the bolt and tighten it down securely. Thread a Nylock jam nut over the threaded end of the bolt by hand until the threads hit the nylon insert. Use a combination wrench to finish tightening the Nylock jam nut.